My husband often asks me, as he loads the dishwasher, why everything I make takes so many bowls, pans and utensils. So I decided to make a one-bowl cake, using just a bowl, a whisk, a pan, two measuring cups and two measuring spoons. 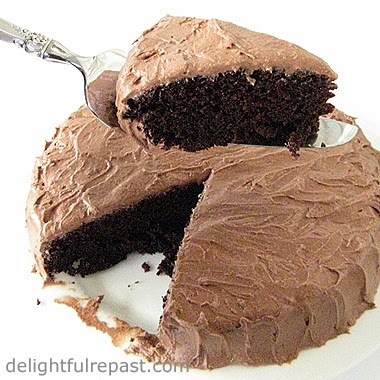 It's a cake, with no eggs or dairy, that was called "depression cake" during the Great Depression when eggs and dairy products were often hard to come by. 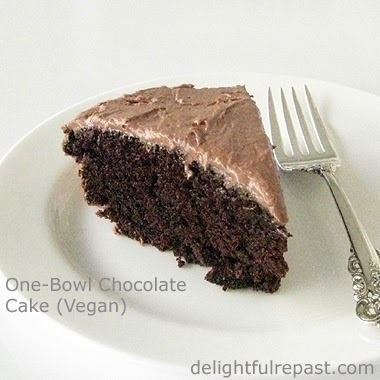 Now we can just call it a vegan cake. Or, maybe, a recession cake. Anyway ... If my dad were alive, I would not be making this cake for him or even talking to him about it. Even though The Depression was ancient history, he could still get pretty riled up about it. As I mentioned in my Vegan Applesauce Spice Cake post two years ago, if the subject came up and my mother (whose family had not experienced the same hardships his had) said anything at all, he would have to tell her once again (loudly and at length) that she didn't know anything about it. I can still see that vein popping out ... and me thinking "Here we go again!" But back to the cake ... Back then, a dusting of powdered sugar might have been quite extravagant. But since this is just the Great Recession rather than the Great Depression, maybe we can splurge on a little whipped cream or buttercream frosting (unless you're vegan)? Please leave a comment about the cake, that era, vegan cooking, stuff your parents argued about, anything at all! PS I saved a piece for three days, just for test purposes, and it was still fresh and fabulous! I had thought it might dry out since it has no eggs. 1 Grease, grease and flour, or spray with cooking spray one 8-inch round 2-inch deep cake pan (Don't even bother with shallow cake pans!). And a circle of parchment paper in the bottom will ensure successful removal from the pan, if you have that concern. Preheat oven to 350 degrees. Note: If you want to get fancy and make a sweet little layer cake (the size I make for an afternoon tea), divide the batter between two 6-inch round 2-inch deep cake pans and bake for 25 to 30 minutes. 2 In 2-quart bowl, whisk together flour, sugar, cocoa, baking soda and salt. Add water, oil, vinegar and vanilla extract. Whisk vigorously for about a minute, or until smooth. Pour into prepared pan. Run a knife through the batter a few times to break up any large air bubbles. Bake for about 30 to 35 minutes, or until it tests done with a toothpick. 3 Let cool in pan on wire rack for 10 minutes. Invert onto the rack to cool completely. 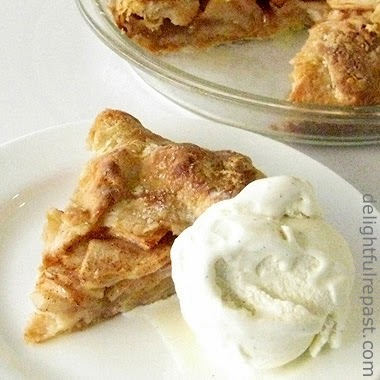 Homemade apple pie is one of my favorite winter desserts. But sometimes it just seems like too much trouble. You know what I mean? Rolling out two crusts, peeling and slicing all those apples, making a pretty crimped edge. I just wasn't up for all that today. The solution? A little rustic tart. The rustic tart is quicker and easier than a double-crust pie or tart. You can make it free-form on a baking sheet, as I did for my Rustic Peach Tart, or make it in a 9-inch glass pie plate. Just make the same amount of dough you would for any 9-inch single-crust pie, but roll it a bit larger to about 14 inches. 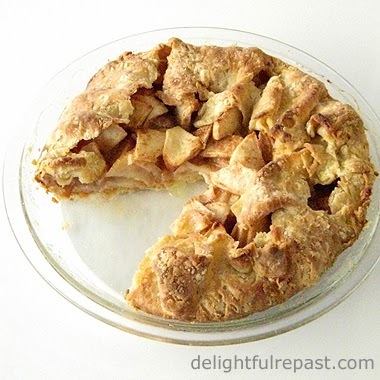 Center it in the pie plate, not worrying about evening up the ragged edges, pour in the filling, and then bring that raggedy overhanging pastry up over the apples. I hope you'll leave a comment and perhaps explore more of Delightful Repast while you're here. If you see something you like, be sure to Pin It, tweet it, whatever-social-media-you-have it. *I usually use half each of two varieties; such as, Fuji and Pink Lady, Granny Smith and Golden Delicious, or Braeburn and Pippin. 1 In medium bowl, whisk together flour, salt and baking powder. 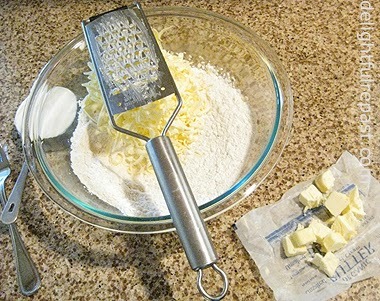 With coarse grater over bowl, shred the butter over the flour. (Don't try to shred the very last--you'll shred your fingers; just cut it up.) Stir with a large dinner fork, making sure all the shredded butter is coated with flour. Mixture should be very chunky. 2 With the fork, stir in the sour cream. If you pinch some of the crumbly dough and it holds together and there isn't a lot of dry flour in the bowl, you've used enough sour cream. If not, either add a bit more or sprinkle on up to a tablespoon or so of cold milk, a teaspoon at a time. 3 Turn the crumbly dough out onto a square of plastic wrap and shape it into a 5-inch disk. Wrap tightly in the plastic wrap and chill in the refrigerator for at least 30 minutes or up to 3 days. 5 Preheat oven to 425 degrees. Prepare the filling just before you roll out the pastry. In tiny bowl, whisk together sugar, flour, cinnamon and salt. Peel and core the apples, and slice them into a medium bowl. I slice them like this: Peel the apples, cut them in half through the stem end. With a melon baller, remove the core from each half; with paring knife, trim away the peel from the ends. 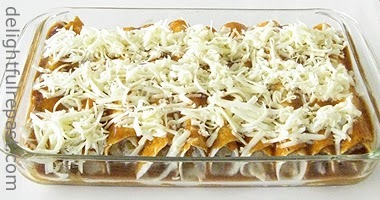 Cut each half in half lengthwise and slice thinly crosswise. You should have about 4 cups. Stir in the sugar mixture. 6 Lightly flour a square of parchment paper on the counter. Place the disk of dough in the center and sprinkle it lightly with flour. If you like, place the reserved piece of plastic wrap on top of the dough. With floured rolling pin, roll out the disk, rolling from center to edge and rotating by quarter-turns to make a round shape, to a 14-inch circle. Don't worry about ragged edges; this is a rustic tart. 7 Butter a 9-inch glass pie plate, using about 1/2 teaspoon of butter. Transfer dough to pie plate, paper side up; remove paper. 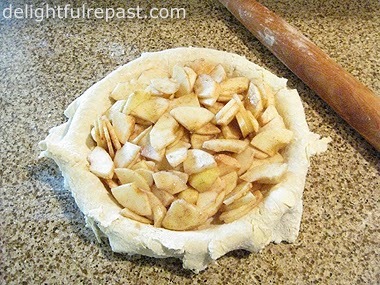 Press dough into the pie plate without stretching, leaving the raggedy-edged overhang untrimmed. 8 Pour in the apple filling in an even layer. Bring the overhang up over the apples a little at a time, sort of "pleating" as you go. Don't try to be cute -- we're going for rustic here! 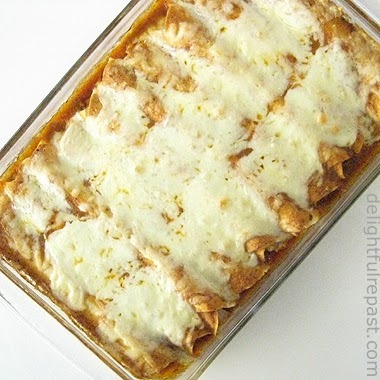 Bake at 425 degrees for 20 minutes; reduce heat to 350 degrees and continue baking for 30 minutes. 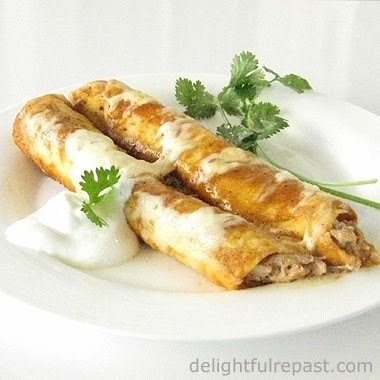 Can be served from the pie plate or lifted out and placed on a serving plate. Classic cream scones, with heavy cream (also called double cream or whipping cream) replacing the butter and milk, are incredibly light and airy. Since you don't have to spend time working the butter into the flour, these scones come together quickly. Scones have infinite variations, which works well for me because when I want a scone, I want it now! If I have buttermilk and an egg on hand, I like to make these Scones. 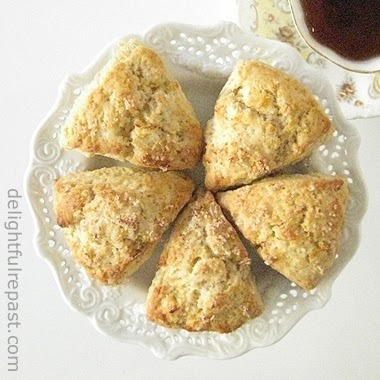 If I have gluten-free friends in for tea, I make these Gluten-Free Scones. The ideal time to make these classic cream scones is after I'm made my Homemade Clotted Cream, which leaves you with a cup of cream that can't be whipped but is perfect in any recipe calling for cream. Whenever I go out for afternoon tea, there are always two scones, one plain and one with dried fruit. I'm listing the fruit in the recipe, but today I made them without. Last time I made them with dried blueberries and a bit of Meyer lemon zest, other times with dried cranberries and orange zest. 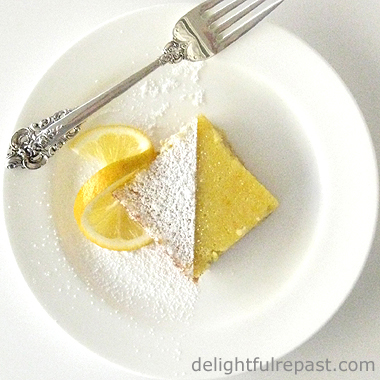 My husband likes it when I brush the tops with a little milk or cream and sprinkle on some coarse organic sugar mixed with lemon or orange zest. How do you like your scones? 1 Preheat oven to 450F/230C/Gas8. In medium bowl whisk together the flour, sugar, baking powder and salt. Stir in orange zest and dried fruit to coat and separate. 2 Make a well in the center of the flour; pour in the cream and vanilla. Combine with just a few stirs with a fork. With one hand, press dough against sides of bowl, gathering up the loose flour and bringing the dough together. Cut dough into two equal pieces. 3 Line a large baking sheet with parchment and sprinkle two 5-inch circles lightly with flour. Place the two pieces of dough onto the two floured circles on the parchment and gently pat the dough, dusting with flour as needed, into two 5-inch rounds. 4 Cut each round into 6 wedges, dipping your knife or bench scraper in flour between cuts. Pull the wedges out and space them an inch or two apart. 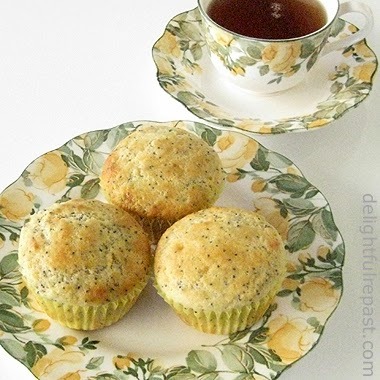 Brush the tops with a little milk, cream or melted butter; sprinkle with zest/sugar mixture, if you like. Bake for about 13 minutes, or until golden brown. Note: To reheat room temperature scones, wrap loosely in foil and heat at 300F/150C/Gas2 for 10 minutes.